Samantha Stosur has plenty at stake in her second round clash. 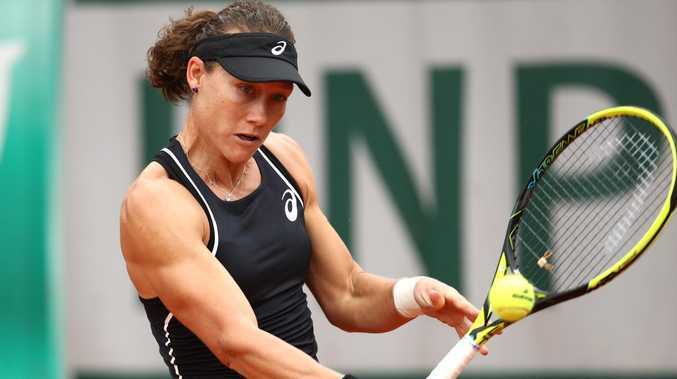 SAMANTHA Stosur will cast friendship aside when she jousts with her French Open doubles partner in one of the veteran's most significant matches in years. While fellow Australian Ashleigh Barty's show-court blockbuster with Serena Williams is commanding all the attention in Paris, Stosur's clash with Anastasia Pavlyuchenkova on Thursday night (EST) shapes as a potential career changer. And it's not even another Roland Garros final for Stosur, or even a semi or quarter-final. It's only the second round. But defeat - a day after fist-bumping her way into the doubles second round with the Russian - will send Australia's only grand slam singles winner in the past 15 years spiralling out of the world's top 100. Already down to 90th after missing four months of the 2017 season with a stress fracture in her hand, cruelly sustained while making another signature charge at last year's French Open, Stosur is projected to fall to No.110 with a loss to Pavlyuchenkova. The 34-year-old was last ranked outside the top 100 a decade ago during her comeback from Lyme's disease. Largely entrenched in the top 25 since her breakout run to the semi-finals for the first of four times in Paris in 2009, Stosur knows full well Pavlyuchenkova looms as a serious threat. The Russian is one of the few players with a winning record over Stosur on clay, with the Queenslander only breaking through against her for the first time on dirt this month in Madrid. "Obviously we know each other very well," said Stosur, a 6-3 6-4 doubles winner with Pavlyuchenkova on Wednesday against Lesley Kerkhove and Lidziya Marozava. "It's going to be hard. The Madrid match I thought I played very, very well and it was still three sets. "So she's a very dangerous player. She can come up with the goods." So too of course can Stosur, with the former US Open champion striving to reach the third round in Paris for the 10th successive year. She makes no secret of her love affair with Roland Garros. Daria Gavrilova plays in the second round on Thursday night. "The courts, they're just so good," Stosur said. "Hitting here, everything feels crisp out of the racquet. It's just got a different feeling here. "Coming in from Strasbourg, we caught the train again and had a light hit the first day I arrived, but it's got a different buzz about it. "All the slams do but, for me playing here, definitely it's somewhere where I've probably had most of my best wins of my career, so I always love coming back." Fellow Australian Daria Gavrilova, seeded 24th, is also chasing a third-round berth on Thursday night against American Bernarda Pera, the world No.73.